Perfect for everyday wear and travel,spacious and economically price. Fashion and classic forever . This bag is very large,Suitable for shopping,outdoor sports and travel. Humanized design which could be used as a purse, hobo handbag, school bag, messenger bag ect. Large roomy open compartment provides ample storage with quick and easy access for all of your essentials. Please allow 0.2"-0.9" in size error due to manual measurement. And please confirm the size info according to our description instead of the photos. Washing instructions:Our Product Is Brand New and Canvas Have a Few Smell ,So when you wash it first time, please let it soak for a few hours in salt water . Just use a little salt. Material: washed cotton canvas, it feels durable and soft. The shoulder bag not only fashion, but sturdy . Large Roomy Capacity: zipper top main pocket easy hold A4 books and 13 inch laptop; Inner 2 zip pockets for your wallet, phone, ipad and other valuables.Perfect for holding your iPad, books, umbrellas, drinking flasks, wallet, sunglasses, cigarette, tissue and other stuffsiPad. 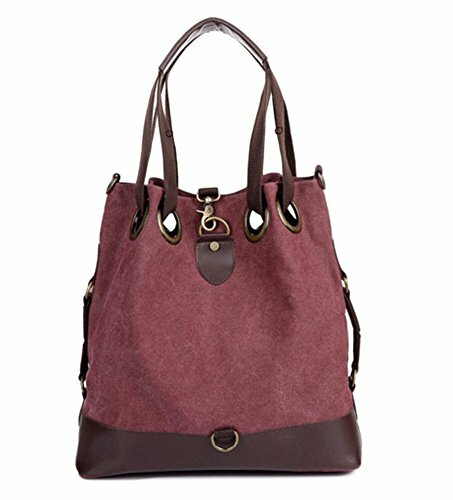 Suitable for Most Occasion: you can used it as a casual purse, weekend travel tote, school bag , office bag, shopper tote , diaper bag, etc. This bag will be your best choice. Too many choices to choose, just follow your heart. M Size：(L)14" x (W)5" x (H)14"; portable :8 inch. If you have any questions about this product by WLE, contact us by completing and submitting the form below. If you are looking for a specif part number, please include it with your message.